Young Triton squad swept in pair of MPSF matches. 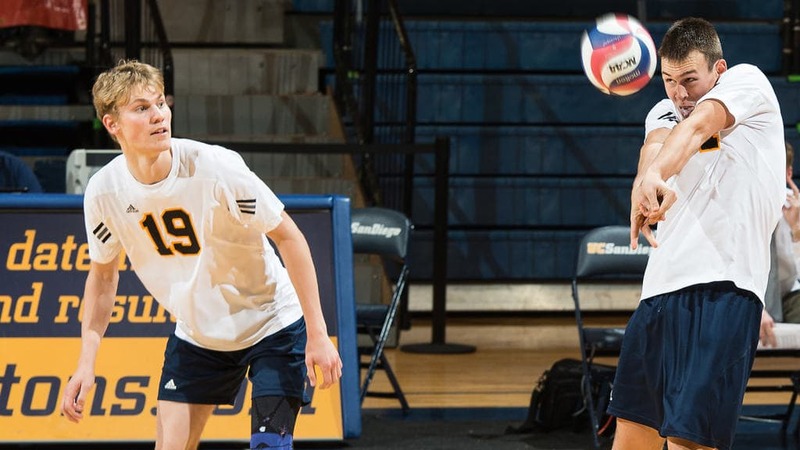 The drought continues for the UCSD men’s volleyball team who recorded back-to-back losses this past week, falling in three sets in both encounters. The Tritons were defeated 25–14, 25–16, 25–19 by No. 5 University of Southern California on Thursday night’s home opener at RIMAC Arena before falling to California Baptist University by scores of 25–21, 25–13, 25–11 at Van Dyne Gym the following night. Thursday’s match began with USC proving their esteemed ranking as the side produced a triple block to grab the opening point and another block from outside hitter Alex Slaught to double their lead. Despite a quick visitor lead, the Tritons fought back, producing five kills to bring them within one point of the Trojans at 9–8. However, USC picked up the next six points, which featured three attacking errors and a service error on UCSD’s part to allow a commanding lead at 15–8. From there on out, the Trojans maintained the upper hand to take the set 25–14. In the third and final set, the Tritons put up much more of a fight to pressure USC. Despite an early Trojans’ edge, a four-point swing from the Tritons featuring a double block from Syftestad and redshirt freshman middle blocker Bryan Zhu, as well as kills from Syftestad and sophomore outside hitter Ian Colbert, brought the teams level at 7–7. Once again, however, the Trojans managed to push away from the Tritons to take a 15–10 lead. UCSD looked to stage a late fight by taking three points a row featuring Syftestad’s 10th kill of the match, bringing the scores to 22–18, but ultimately USC proved their worth and powered through to take the set 25–19 and a deserved match victory. It was a similar story as UCSD travelled to California Baptist University on Friday. The Tritons started the better of the two sides taking a 5–1 lead thanks to a three-point service rotation from junior outside hitter Kirill Rudenko, which included an ace. However, three attacking errors in a row in the middle of the set from UCSD gave CBU their first lead at 14–13. The Lancers kept the lead for the rest of the set, eventually triumphing 25–21. In the second, the Tritons faced an early uphill battle, falling behind dramatically at 9–1. The Tritons found it nearly impossible to get back into the game after this, and a six-point surge at the end of the set helped CBU take the second set at a 25–13 score. The third set proved to be a replay of the second as UCSD quickly fell behind 5–1 much due to three aces from the Lancers’ Rocky DeLyon. The momentum stayed with CBU who dominated proceedings with flourishes of unanswered points, quickly building up a 16–4 lead. Kills from outside hitters redshirt freshman Calvin Manchenko and freshman Luke La Mont looked to spark life into the Tritons’ offense but proved to be of no avail as CBU took the set 25–11 and left the Tritons 1–5 overall and 0–4 in the Mountain Pacific Sports Federation. Ring attributed the tough start to the season to a lack of experience for a team that features 16 freshmen. “Our inexperience and knowing how to play in a match like this, to struggle and how to pull yourself out of it [are] challenging as well,” Ring said. The Tritons return home for their next encounter on Wednesday, Jan. 28, hosting Princeton University at 6 p.m.